It seems that car keys easily go missing or lost. Before the 1990s, this wasn’t an issue because it was easy to have a copy made of your car key. But it was also easy for someone to steal the car. Advances in key technology have made automobiles much more anti-theft, but at a more expensive cost to the driver. 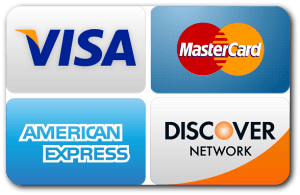 There are four key types that an automobile owner may possess. 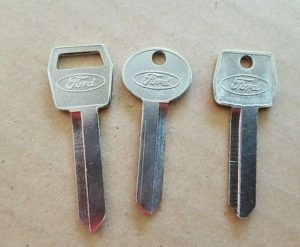 Basic Key – Basic car key, which was common until the late-1990s has little security features other than a unique cut. The shank, which is the long metal portion of the key, has cuts and grooves similar to a house key. Transponder Key – After the late-1990s, manufacturers started putting a transponder chip in the plastic head of each key. The chip emits a signal to a receiver in the ignition. If this “immobilizer” within the ignition detects the wrong signal — meaning that the wrong key is being used — the car won’t start. This chip needs to be programmed by a professional locksmith in Portland before it can start the vehicle. A transponder’s shank is either a basic or laser-cut. In some vehicles, the transponder and the fob are an all-in-one unit. However, this adds to the price and makes it more difficult to get a spare anywhere but at the dealership. Laser Cut Key – You can tell a laser-cut key apart from a basic key because the shank is thicker and possesses fewer grooves. Laser-cuts are often referred to as sidewinder keys, due to the distinctive winding cut on the shank. Laser-cuts also have built-in transponder chips that need to be programmed by an automotive locksmith. Switchblade Key – A switchblade key has a shank that can fold inside of the fob when not in use and easily popped out of the fob when needed. They can either be basic or laser cut. One interesting note about the switchblade is that you can purchase each component separately. If your key got worn out or no longer functions, you can buy the shank separately. But more likely is that the entire key is missing, in which case you’ll need a full replacement. 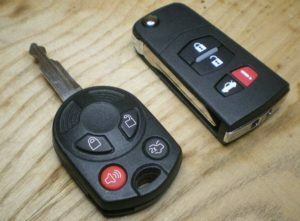 Smart Key – Smart keys aren’t traditional keys, they are fobs that are either inserted in the dash or stay in your pocket. The car turns on and off with the press of a button on the fob. The biggest security advantage of a smart key is that they utilize rolling security codes. The system randomizes the correct code in order to prevent thieves from being able to hack it through the utilization of a device called a code grabber. The vehicle’s computer recognizes the code emitted by the smart key and verifies it each time before starting the engine. Mercedes-Benz was one of the first automakers with this technology and coined the term “Smart Key“. There’s no denying that modern keys are expensive. It is better to get a spare key now, on your own time and terms, than to stress out and spend the money in what could very well be an emergency. For easy access to your car when you are locked out in the future, you can order a basic key without the transmitter. This key will open all doors and the trunk but it will not start the engine.